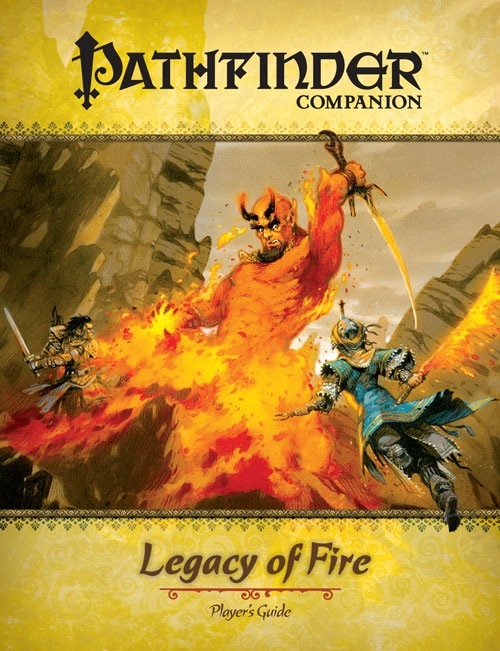 Over winter break, one of my players forwarded me a link to Paizo’s Legacy of Fire adventure path, with the message “You NEED to run this.” Legacy of Fire (LoF) is the last 3.5 Pathfinder Adventure Path; originally intended as the successor to Savage Tide, LoF takes the Pathfinder spin on an Arabian-themed setting of genies and gnolls. Being the guy with all the old Al-Qadim box sets and an interest in Arabian Nights settings, I was hooked. Looking over the info on Paizo’s website, I thought the campaign looked pretty cool. So when I walked into a local game store and saw the full 6-issue set sitting there, I did the only logical thing and dropped $120 to buy them. When it boiled down to an off-week when only two people showed up, I was finally pressured into running Legacy of Fire. (Not that it took much pressuring.) Since there were only two players, I gave them some extra edges. First, I let them pick bloodlines out of Unearthed Arcana, which messes up their progression as they “give up” three levels worth of xp to get minor boosts at each level. (For example, they picked Efreeti and Djinni as their respective bloodlines, and both got Improved Initiative as a bonus for second level.) Second, they picked some Traits out of the other Paizo supplements, essentially background feats which aren’t equal to a full feat. Traits have proven to be very popular; the players get a minor but interesting boost, some flavor, and they also work as adventure hooks. And with that, our heroic Ranger and Cleric were off, hired to clear the fallen city of Kelmarane of a gnoll infestation. The adventure is a nice blend of dungeon and wilderness encounters, and in fact starts with a more roleplay/skills-based session centered around chaos in the caravan with a burning wagon. It’s a good way to get the characters in on the action, and panders to all characters; some can calm the animals, others can help with the bucket brigade, others can heal a trampled soldier. And, in the end, it worked out to the advantage for the small group, earning them XP without nearly killing them (more on that later). Low-level 3.5 can be brutal—we’ve all heard the “orc with a crit kills anything” complaints—but LoF got around that issue by having a less-lethal, still-deadly intro to the campaign. After that, there’s a creepy snipe hunt out in the cacti fields, then the players clear out an abandoned monastery to Saranrae, the Pathfinder world’s goddess of sun and healing and the Cleric’s patron diety. The enemies for this section are the local gremlins, horrible creatures which are less dangerous than goblins but far more annoying, since they have an aura of unluck. Any time a player rolls a d20, they instead roll two and take the worse result. Again, I’m a big fan; instead of being a major threat to the characters, the gremlins are an annoying nuisance, easily killed but hard to hit. They also set up shop in dangerous locales, like the middle of a cacti field, a kitchen filled with broken glass, and the rickety balcony of the monastery’s chapel, leading to some cinematic scenes as the players fight both the gremlins and the terrain. Currently, the players have set up camp in the monastery, and are clearing out Kelmarane slowly. The town is pretty beastly; it’s got a number of gnolls and some more dangerous guardians, including some taken from Green Ronin’s Book of Fiends and Necromancer’s revised Tome of Horrors. I’m actually surprised at how easily they take out the groups of four gnolls, but most of the encounters are fairly rough: every encounter over EL3 usually ends with the animal companion and the Cleric in negative hit points. My two determined third-level players have managed to overcome them all, though not without a lot of bleeding and bad rolls. There’s a lot of depth to the Path, and some interesting subplots which come up later on and eventually “hook” the characters into the Adventure Path from the simple start of gnoll killing. The Pathfinder world of Golarion is nicely fleshed out, unique enough to be memorable, familiar enough to connect with, and dark enough to make Paizo’s “Golarion Needs Heroes” ads work. There’s a lot of awesome details in Katapesh, where LoF is set: the cacti are an opiate cash-crop for the nation, addictive narcotics which can give some bonuses if ingested, and in the second issue there’s a nice overview of the goddess Saranrae. The modules look amazing: the art is top-notch really sells the books by their awesome visuals, the borders are evocative Arabian flair, and the inside covers are little illuminated folio myths done by Wolfgang Baur. There’s a fiction section in each book done by Elaine Cunningham, and a bestiary featuring a nice selection of new monsters, and besides the 50-or-so pages of adventure there’s a smaller side-adventure in each book. All in all, a worthy successor to Dungeon magazine. When the first session wrapped up, Matt, the Cleric player, exclaimed “Man, I forgot how much fun D&D could be.” Things like that tell you you’re running a good game. Considering they keep heckling me to run it, Legacy of Fire is a solid success, and I have nothing but praise for it and the guys at Paizo who came up with it. I’m almost done with the first module, “Howl of the Carrion King,” and we’re hoping the rest will be just as awesome. Fireball is dead. Long live Comet Storm!